Assyria denotes the realm of the god Assur - its heartland was in the lands of the Upper Tigris in modern Iraq. It became an important state: and had two turns at being a powerful empire, in the late bronze and early iron age, ending in 612 BC, after defeat by the Medes and Babylonians. . Babylonia denotes the southern part of modern Iraq - from Baghdad to the Gulf, with its heartland between the Euphrates and the Tigris (Mesopotamia). From the 18th to the 8th century BC it was a powerful state. It then became subject to Assyria, until 612 BC, when the Neo-Babylonian empire was established. It was overthrown by Cyrus in 539 BC. These two earlier empires provided a template for the Achaemenids in establishing and consolidating their rule. The Persians learned from their mistakes, but also benefited from precedents set by their powerful predecessors. They inherited from them profound cultural influences - on art and iconography, architecture, administration - and adopted their cuneiform writing system.. I am Ashurbanipal, great king, mighty king, king of the World, king of Assyria, king of the four quarters, offspring of Esarhaddon, king of Assyria, governor of Babylon, king of the land of Sumer and Akkad, descendant of Sennacherib, king of the World, king of Assyria. Their men young and old I took prisoners. Of some I cut off their feet and hands; of others I cut off the ears noses and lips; of the young men's ears I made a heap; of the old men's heads I made a tower. I exposed their heads as a trophy in front of their city. The male children and the female children I burned in flames; the city I destroyed, and consumed with fire. He set the precedent for the Assyrians' main weapon of war - terror. Their accounts of their successes inevitably highlight their savagery after victory; endless lists of flayings alive, impalings, amputations of arms, legs, ears and noses. Small wonder that most enemies, even strong ones, preferred to surrender and plead for mercy. Also decisive was their mastery of siege techniques, and their understanding of the importance of training and organisation. He built himself a palace in his new capital at Nimrud (north of Baghdad), adorned with relief carvings, most now in the British Museum. The site has recently been trashed by Daesh (2015). He was succeeded by his son Shalmaneser III (859 - 824 BC). Like his predecessors and successors as kings of Assyria, his militaristic regime needed constant battle experience - and territorial expansion. His armies fought in the west - against the Aramaeans, Arabs and Israel (king Ahab). The Battle of Qarqar was not decisive - and Shalmaneser had to be satisfied with some effective ravaging and pillaging. He expanded and consolidated territorial gains to the east (Zagros mountains) and north (Urartu). He recorded his deeds on the "Black Obelisk" - erected in 859 BC, and now in the British Museum. It refers to Israel (possibly king Jehu) and Parsua (the first ever mention of Persians). After Shalmaneser III, weaker rulers led to a decline of Assyrian power - this was halted by the usurper Tiglath-Pileser III ((745 -727 BC), under whom the resilient Assyrians rapidly recovered. His task was to reassert control of Babylonia, Syria and Urartu, in which he succeeded completely. He created a dual monarchy in Babylon, allowing the Babylonians to have a semblance of independence - the leading Babylonians never accepted the arrangement. He also campaigned against the Israelites and Arabs, and took much of western Iran from the Medes and Elamites. A weapon of control which he developed was mass deportation of peoples (eg Syrians to Assyria). He also recruited conquered peoples into the army, creating a year-round standing army. Translation: "In the month of Abu, the month of the descent of the fire-god, destroyer of growing vegetation, when one lays the foundation platform for city and house, I laid its foundation walls, I built its brickwork. Substantial shrines, built firm as the foundation of eternity, I constructed therein.... Palaces of ivory, mulberry, cedar, cypress, juniper, and pistachio-wood I built at their lofty command for my royal dwelling-place." Sargon II was succeeded by his son, the crown-prince Sennacherib (705 - 681 BC), already a seasoned soldier. He rebuilt the old Akkadian city of Nineveh (Mosul) as his capital, and constructed a massive palace there for himself. The eldest of his seven sons was made king of Babylon: this was too much for the Babylonian leaders, who had him kidnapped there and handed over to the Elamites. Sennacherib in revenge launched a furious (and later much-criticised) assault on the ancient city. He utterly destroyed the city and all its temples and images of the gods - except Marduk, whom he transported to Nineveh. 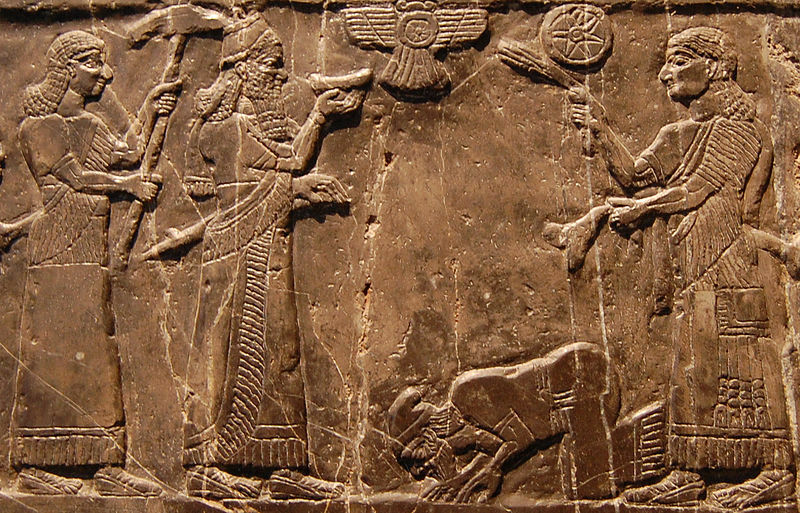 Sennacherib tried to use religion to defuse the "Babylonian problem". It didn't work, and Babylonian resentment was merely fuelled: it would eventually destroy the Assyrian empire. I sought out all of the guilty soldiers who wrongly incited my brothers to exercise kingship over Assyria, and imposed severe punishment on them: I exterminated their offspring. Esarhaddon expanded the empire to include Egypt, and tried to dampen down the Babylonian problem by rebuilding Babylon. But he suffered from a mysterious illness throughout his reign, which made him paranoid and suspicious: he mistrusted his male relatives, and relied heavily on Naqi'a, Sennacherib's widow. To forestall the succession problem, which had caused him so much trouble, he appointed his eldest son Shamash-shumu-ukin as crown prince of Babylon and a younger son Ashurbanipal as crown prince of Assyria - supposedly "equal brothers". NEXT: ASHURBANIPAL, KING OF THE WORLD. Much of this formula was taken over by Cyrus and the Achaemenids - particularly the title "Great King". 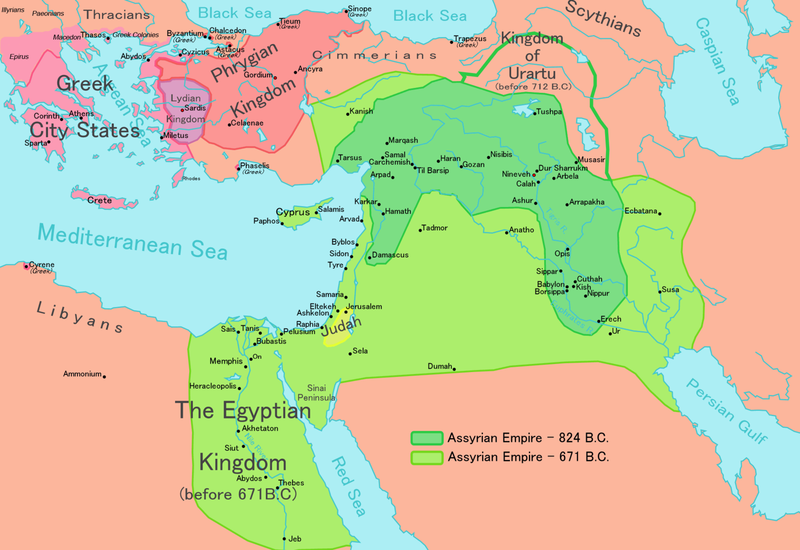 There was never an Aramaean state - merely a number of small independent kingdoms in Syria and the Levant which flourished from the 11th century BC until they were absorbed by the expanding Assyrian empire. As a distinct people they disappeared, but their language, Aramaic, was adopted by Tiglath-Pileser III as an official language along with Akkadian. It soon became the lingua franca of the entire region, and was adopted by the Achaemenids, which spread it even further. It would be understood from Egypt and Libya in the west to India in the east. It's survived competition from Arabic, and is still spoken by some small isolated mostly Christian communities in Syria (see Maaloula on Wikipedia). The site (deserted after the fall of Assyria in 612 BC) remained overgrown and unknown until its rediscovery in 1845 by the Austin Henry Layard. The first time history noticed the camel-mounted warriors of Arabia. He laid out new streets and squares and built within it the famous "palace without a rival", the plan of which has been mostly recovered and has overall dimensions of about 503 by 242 metres (1,650 by 794 ft). It comprised at least 80 rooms, many of which were lined with sculpture. 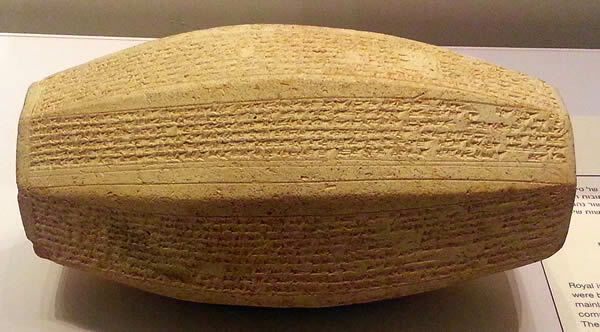 A large number of cuneiform tablets were found in the palace. The solid foundation was made out of limestone blocks and mud bricks; it was 22 metres (72 feet) tall. In total, the foundation is made of roughly 2,680,000 cubic metres (3,510,000 cubic yards) of brick (approximately 160 million bricks). The walls on top, made out of mud brick, were an additional 20 metres (66 feet) tall. Some of the principal doorways were flanked by colossal stone door figures weighing up to 30,000 kilograms (30 t); they included many winged lions or bulls with a man's head. These were transported 50 kilometres (31 miles) from quarries at Balatai and they had to be lifted up 20 metres (66 feet) once they arrived at the site, presumably by a ramp. There are also 3,000 metres (9,800 feet) of stone panels carved in bas-relief, that include pictorial records documenting every construction step including carving the statues and transporting them on a barge. One picture shows 44 men towing a colossal statue. The carving shows three men directing the operation while standing on the Colossus. Once the statues arrived at their destination, the final carving was done. Most of the statues weigh between 9,000 and 27,000 kg (20,000 and 60,000 lb). The stone carvings in the walls include many battle scenes, impalings and scenes showing Sennacherib's men parading the spoils of war before him. Dramatically told in the Jewish Bible at 2 Kings xix 37. 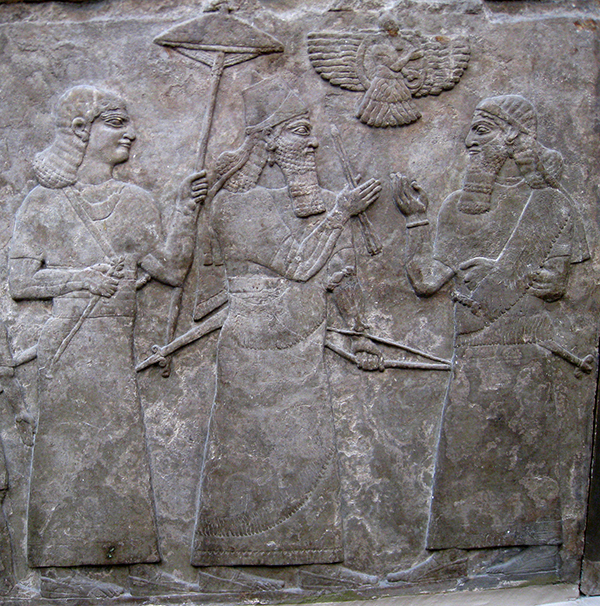 The Queen mother during the reign of Esarhaddon, and possibly continuing during Ashurbanipal's. though we have no evidence. Some believe she wasn't an Assyrian - maybe a Babylonian, or even a Jew, one of those sent by Hezekiah to Sennacherib in 701 BC. Letters from her to Esarhaddon are an interesting insight into his reign.